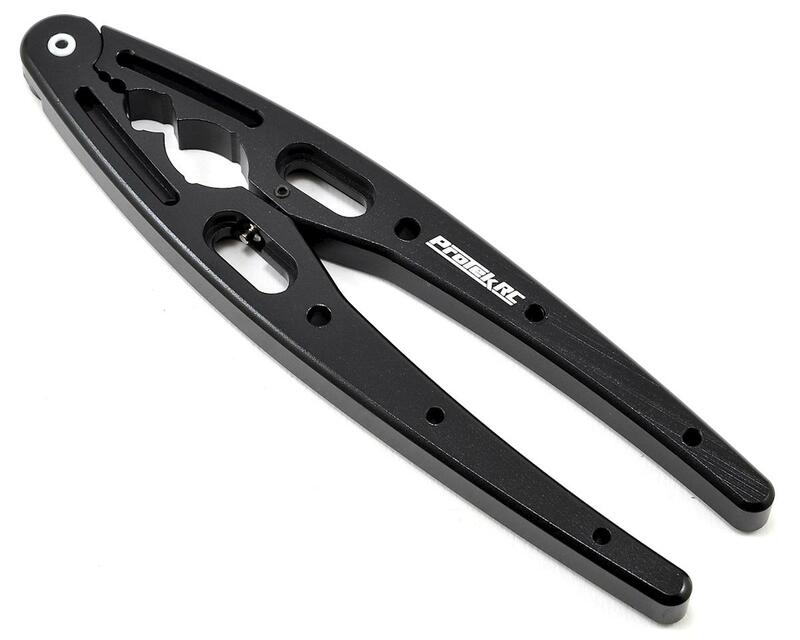 This is the ProTek R/C "TruTorque" Shock Shaft Pliers. No one wants to spend money on low quality tools. Tools are an investment that should not be taken lightly and are one of the few items that should outlast the life of the model you are working on...and remain with you for years after. With so many choices available, the decision can be overwhelming. So ProTek R/C has stepped up again, expanding its product line with a complete range of affordable, high quality tools that help to make the decision a little easier. 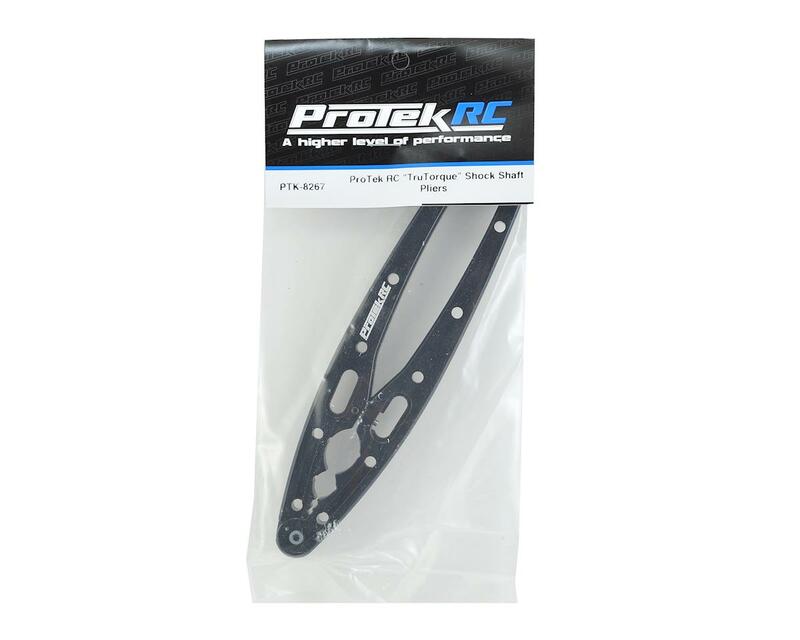 The ProTek R/C “TruTorque” Shock Shaft Pliers are for use with 1/10 and 1/8 scale shocks and are made from lightweight aluminum material and finished with a silky black anodize. The pliers feature a “nutcracker” style construction which eliminates any hard or sharp edges that could potentially cause damage. This style also provides increased leverage while providing the user with a direct feel for the amount of pressure being applied. The ProTek R/C “TruTorque” Shock Shaft Pliers aren’t only for shock shafts; the pliers feature the ability to also capture shock bodies! Just secure your 1/10 or 1/8 scale shock body into the pliers and tighten down the shock cap. No more shock building headaches or slippery shock fluid ruining your grip. As a bonus, the pliers also feature the ability to pop the shock end pillow ball in and out of place thanks to the ingenious stepped post built into the pliers. The stepped post fits 1/10 and 1/8 scale ball sizes. Very good set of shock shaft pliers. No scratches or noticable marring on the shock shaft surface. The shock shaft pliers are super helpful with removing and installing shock end balls. Well built and durable so far, makes screwing in the shock ends a cinch. As an added benefit it makes a great nut cracker when you're snacking on nuts and working on your rc's. Works especially well on pistachios that haven't split yet. Just make sure you clean off all of the shock oil before you go cracking your nuts. 10 customers found this review helpful. Very versatile & handy tool to have in the tool kit. Quality built, & quality to the touch. way to go Protek, you made a keeper..
WOW I had no idea what I was missing as far as tools till I got these. Absolutely an rc MUST HAVE. This is one tool you should definitely have in your pit bag. I've had mine for a couple of years now and I wouldn't know what to do without them!! The TruTorque Shock Pliers are no joke and worth every penny! The design is incredibly ergonomic and gets the job done with ease. The Ball tool built into the handle is brilliant. No more tweaking Hollow Balls in with needle nose pliers or gouging your rod ends trying to get them out. Nicely done ProTek. Great tool for holding the shaft while threading on the end. Used plastic over pliers b4 to keep shafts unmarred. So much easier with these and haven't marred any shafts yet. Didn't know what I was missing. Having good tools makes RC a much more fun hobby. This is one of the top tools in my box. Makes working on shocks very easy now. My favorite feature is the ability to deal those dreaded ball ends. A must have tool for your box! I've finally had a chance to purchase this tool, as its always "out of stock" - I guess due to it popularity and positive reviews. I normally hate building/rebuilding shocks but this made it all so easier. I wish I had this tool sooner. Absolutey a must when building shocks,great tool,great price,use it more than antthing for tuning shocks,changing Pistons is not a chore anymore!!!!! This is such an awesome tool, it's amazing. Useful in so many ways. Had it in my wishlist for a while and I finally grabbed one. So happy I did, guys you gonna get one. I have used these once and I already don't know how I ever lived without them. I've used the shock shaft pliers a bunch since I got them. What a great tool, one of my best purchases yet. The pillow ball remover/installer is genius, works great. Recently got this and loving it so far. I am using it for my Losi 8-ight-e 3.0 buggy build. Does what it supposed to do. The fitting (shock shafts, shock caps, ball links) are very nice and smooth (feels professional :) ). There are other shock pliers out there (like the Tamiya and Integy ones) but I would never switch over to them. The Tamiya one seems for smaller shocks. The integy one...na...I'll stick with this. Great shock tool. The best I've used. The shock shaft pliers are as expected. Holds the shaft easily without marring the shaft, but the real bonus is the built in tool for assembling the ball ends. I use it when building all of my kits for assembly of all of the turnbuckle ends and shock ends. Really make it easy to assemble and DISASSEMBLE the ball ends. Nice work on this tool A-main!! This is the best shock tool i have used so far. I have tried so many but could never feel the right grip with my hands. these seem to be so easy to use i love them. i even used these to pop in some new ball end in my d8 lineup and camber link balls also. this worked on them all. the car i have used this on so far are the team asc ft 2wd and 4x4, the hodbodies d8, 8t, ve8 and a t maxx. this worked on ever ball link on all cars with out a hick up. it also worked on ever shock shaft on all my cars so easy. i even used it to take of some caps just to try it and that worked good but i always just finger tight my shock caps so i dont know if i will be doing that often but it will work. i think i tried everything this toll was made for and accomplished them all with ease. It is a great buy beats the other ones i have tried so far by a lot.